Many potential armed services recruits wonder if it's possible for them to enter one of the branches of service at an advanced enlisted rank, provided they have college credits or experience in the Junior Reserve Officer Training Corps (JROTC). Each of the services has a different policy when it comes to offering advanced rank for those with college credits and other programs, including JROTC. Here's a guide to what's available in the Army, the Navy, the Air Force, and the Marines. When you enter the Army as a new enlisted recruit, you typically are given the rank of private or pay grade E-1. This is the lowest rank in the service. However, those with several different types of credentials can enter at a higher level: private second class (paygrade of E-2), private first class (pay grade E-3), or specialist (pay grade E-4). To join the Army as a private second class, you need one or two years of JROTC experience or 24 credits from an accredited college or university. It's also possible to join as a private second class if you earned Eagle Scout rank in Boy Scouts or the Gold Award in Girl Scouts, or if you completed the National Defense Cadet Corps program. To join as a private first class, you need either: three years of JROTC; one year of Senior Reserve Officer Training Corps (SROTC); or 48 or more college credits. To join as a specialist (E-4), you must have a four-year degree at an accredited college or university. 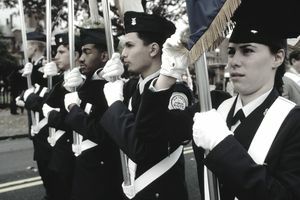 Recruits normally enter the Navy at the rank of seaman recruit, with pay grade E-1. Requirements to enter at higher pay grades and ranks are similar to those for the Army. To enter at the rank of seaman apprentice (pay grade E-2), you must have completed 24 credits at an accredited college or university. Alternatively, you must have completed two years of JROTC or reached paygrade E-2 in the Navy Sea Cadet Corps program. To enter at the rank of seaman (pay grade E-3), you must have completed 48 or more college credits, reached paygrade E-3 in the Navy Sea Cadet Corps program, completed three years in JROTC, or achieved Eagle Scout or Girl Scout Gold. There are programs like Navy SEAL and Nuclear Power School where if you graduate, you will be promoted to E-4. Some in the nuclear program even take the E-5 test before they even get to their first permanent duty station. Nuclear Power School is equivalent to more than 50 college credits. In the Air Force, recruits normally enter at the rank of airman basic, with pay grade E-1. Again, requirements to enter at higher ranks and pay grades are similar to those for the other armed services. If you have two years of JROTC training, you can enter at the rank of airman (pay grade E-2). You also can enter at this level if you have 20 credits from an accredited college or university, or if you have achieved Eagle Scout or Girl Scout Gold. To enter at the rank of airman first class (pay grade E-3), you must have completed 45 college credits or three years of JROTC training. In addition, several awards, including the General Billy Mitchell Award, Amelia Earhart Award, and the General Carl A. Spaatz Award will qualify you to enter at the level of airman first class. There are special operations programs within the Air Force that upon completion will allow successful individuals that have enlisted for a period of six years to be promoted to Airman First Class (A1C). Schools like the indoctrination course (Combat Controller (CCT) and Pararescue (PJ). In the Marines, recruits normally enter the service at the rank of private. Unlike the other services, the Marines don't offer the opportunity to enter at any paygrade higher than E-2. Those who enter at E-2, with a rank of private first class, must have completed two years of JROTC or ROTC, have completed 12 credits of college classes (with a minimum grade point average of 2.3 or higher on a 4-point scale), have achieved Eagle Scout or Girl Scout Gold, or have achieved the grade of E-3 or spent 24 months in the Naval Sea Cadet Corps. Almost all recruits who join with advanced rank are paid the rate of base pay for that advanced rank right from the first day of active duty. However, in most of the services, recruits do not get to actually wear the rank until they graduate from basic training. Make sure the contract you sign has all of your qualifications for advance ranking and what you have to do to ensure you qualify. It is up to you to be proactive with the recruiter or you could miss out on achieving a higher rank and pay more quickly. As with other enlistment incentives, advanced enlistment rank must be included on your enlistment contract.